I introduced my team members to SharePoint Surveys and created one for us to use. Unfortunately, our SharePoint admins (for whatever reason) will not allow us to make templates, so we would potentially have had to re-use the same questionnaire for multiple projects and many of our projects run concurrently. My initial solution to this problem was to create a field that asked the survey takers which project they were taking the survey for. This worked, but I could see this becoming a mess. Also, during this time, some of my co-workers came to me asking if questions could be removed or questions specific to their projects added. I had to tell them that they would have to create a new survey for that. They seemed okay with that and I wrote a rather detailed internal blog post about how to create their own surveys. However, as I was doing that I realized that they would be, essentially, re-inventing the wheel, having to put the same questions in the same surveys. Not an ideal solution. This is the interface. You know me. I’m not a UX girl, I get it to work. Pretty takes a back seat if it works. There are far more questions than this, but for brevity I went with the first 4. [Create Survey] is the button that triggers everything. Results-Shows the results of the operation. I decided to put the questions in a regular custom list instead of using the original survey. I figured it would be easier for the rest of the team to maintain. 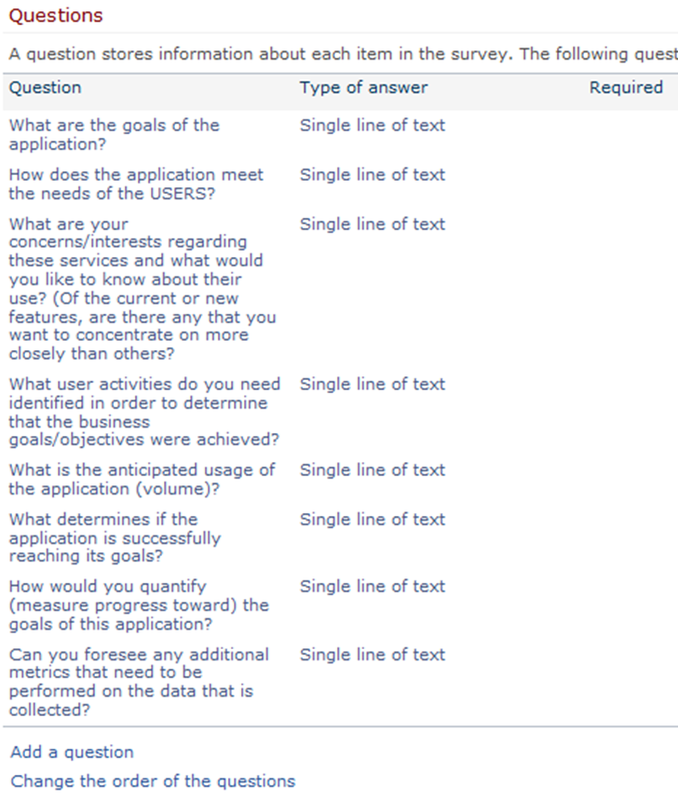 I used a dataview webpart to pull the questions from that list. I tied the creation of the list and the addition of the questions to the ‘crtSurvey’ button on-click function. I used AddList to create the list and UpdateList to create the entries (fields) for the list. The textbox (probably should rename this to something useful later) is the textbox that the user uses to enter the name of the survey they want to create or update. uStat is an object I created to build the command for adding the questions to the survey. AddToView is absolutely crucial to using the UPDATELIST command. You MUST have this in your command or UPDATELIST will not work. Notice that method, defined above as ‘AddList’ is used here for our operation. templateID is set to 102 to identify this as a Survey list. migrateQs is used to call the function that will move the selected questions to the survey list. Keep in mind that using the DataView WebPart with checkboxes creates a series of <INPUT> statements with sibling <LABEL> statements. This snip of code shows how I set up SPServices to update the list with the new questions. Allthelabels holds the results of a jQuery…query for all of the lines that are NEXT (siblings) for EACH of the INPUT statements. Building the UpdateList XML command for SPServices was a little easier using the uStat object I created earlier. This allowed me to not worry about syntax as much and to build the command as needed. The user enters the name of the survey they’d like to create (or update). 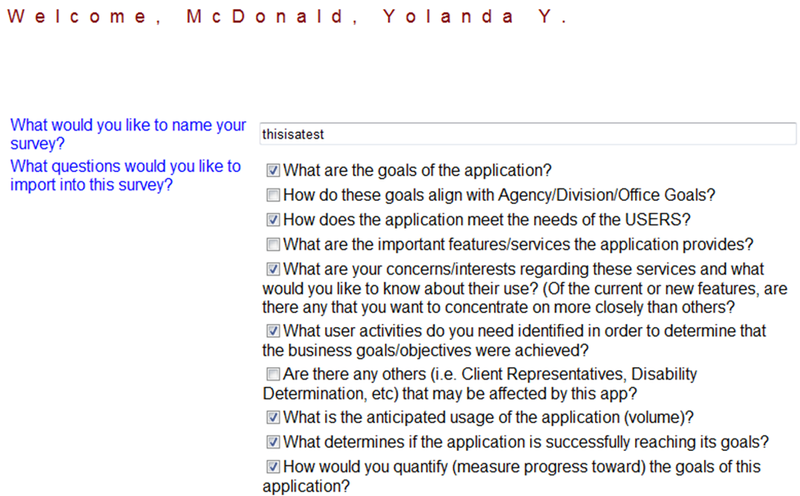 They then select the questions that they would like to include on the survey. This is the UPDATELIST XML statement that is created. The debuggr function shows the result of the WebService call. The new survey is now in your survey group. Remember we defaulted the words ‘auto-gen survey’ when we created the list. Clicking the TestSurvey hyperlink shows us this. Select ‘Settings’->’Survey Settings’ to reveal this. Notice that all of the questions that we selected are now in the created survey. What questions would you like to import into this survey?